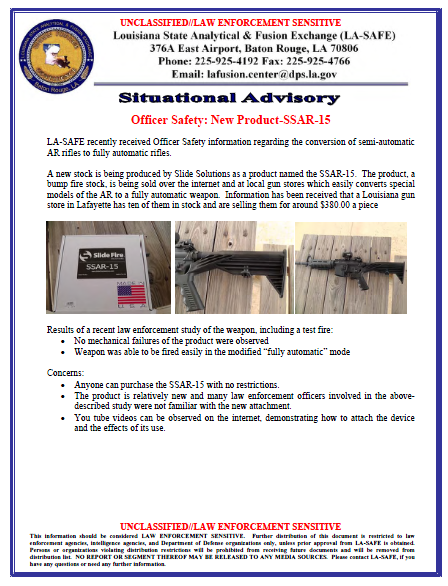 LA-SAFE recently received Officer Safety information regarding the conversion of semi-automatic AR rifles to fully automatic rifles. A new stock is being produced by Slide Solutions as a product named the SSAR-15. The product, a bump fire stock, is being sold over the internet and at local gun stores which easily converts special models of the AR to a fully automatic weapon. Information has been received that a Louisiana gun store in Lafayette has ten of them in stock and are selling them for around $380.00 a piece. • Anyone can purchase the SSAR-15 with no restrictions. • The product is relatively new and many law enforcement officers involved in the above-described study were not familiar with the new attachment. • You tube videos can be observed on the internet, demonstrating how to attach the device and the effects of its use. • The product is offered in a right and left hand version and comes complete with instructions on how to install the product. • The product also comes with a letter from the Department of Justice, Bureau of Alcohol, Tobacco, and Firearms, authorizing the device as “intended to assist persons whose hands have limited mobility to ‘bump-fire’ an AR-15 type rifle.” However, there are no selling or buying restrictions for only handicapped or disabled persons to purchase the items.